My favorite story about the military chaplaincy was that of an unnamed Union chaplain who must have been tired of marching with his troops. So upon entering the Confederate states, he stole the first horse he found on a farm. The Southern farmer, upset about the loss of his horse, complained to the Union Colonel. The latter ordered the chaplain to explain himself about this horse. He answered by saying that Jesus Christ had borrowed a donkey to go to Jerusalem! Whereupon the Colonel made four short points back to the chaplain. One, he wasn’t Jesus Christ. Two, a donkey is not a horse. Three, the regiment was going to Richmond, not Jerusalem. And last, the sooner he returned the horse, the better it would be for him. The horse was returned in short order. The Rev. 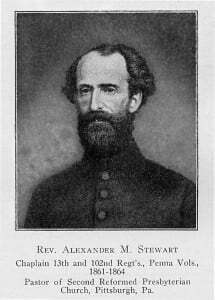 Stewart was received into the regiment as a Protestant chaplain, and served the entire time with the 102nd Pennsylvania Volunteer Regiment. As an aside, he was commissioned to send regular columns back to his hometown paper in Pittsburgh, Pennsylvania, telling of his experiences. Later, in 1865, these columns were published into a book titled Camp, March and Battle-field; or, Three years and a Half with the Army of the Potomac, which can be found here. There are still godly and faithful chaplains in our nation’s military services. Each of our Presbyterian and Reformed churches should adopt a military chaplain, to pray for, encourage, and help in any way for him to fulfill God’s ministry among the troops. Pray for wisdom in this day of political correctness to stand up for truth and righteousness. Contact the Presbyterian and Reformed Chaplaincy of the Ministry to North America, found on line, to find out how you can support those on the front lines of the gospel in the military.